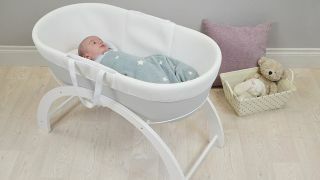 Help your newborn baby sleep safely and snugly at night with our carefully curated selection of the best moses baskets. The arrival of a new baby is an exciting time for any parent – but one of the biggest questions you will face is where baby will sleep when you get him or her home. Most experts recommend that baby sleeps in its parents’ room for the first six months, so you can keep your baby close. However, given that many bedrooms are constrained for space, many parents plump for a Moses basket – a compact carry cot that can be moved from room to room. Most of the best traditional Moses baskets are made of wicker or palm leaf, their woven designs providing natural ventilation to help ensure a sound, comfortable night’s sleep. While wicker and palm are the natural choice, wicker in particular tends to creak. If that’s an issue you may wish to choose a more modern take on the Moses basket, which uses ventilated man-made materials instead. These are also a lot easier to clean which you'll soon be grateful for! The basket you buy should come with everything you need, including a mattress and occasionally you will find some bedding thrown in too (check out our guide to cot bedding if you need any help on this front). You will also need to factor in the cost of a stand or stool to lift the basket off the floor, as most brands charge extra for these. Yes, the costs are starting to predictably rack up! But that's why we have gathered the best deals for you. Once you know where you are going to place your moses basket for the majority of the time, it really is a case of choosing a basket and stand that will suit your home interior; there are a lot of very traditional moses baskets on the market which aren't for everyone as they can look a bit flamboyant for modern homes. However, if you are plumping for a more modern looking moses basket, as mentioned, these tend to be plastic and wipe-easy, making them a good choice and handy for taking to sleepovers or trips to see family as they can get knocked and scraped with little impact to the basket itself. There are also some very elegant and well-designed wooden stands compatible with many traditional Moses baskets that blend in well with living room and bedroom designs. If you decide, while you're reading, to consider a cot instead, we've rounded up the best of them too. Alternatively, many parents opt for a co-sleeper cot to create an element of closeness during the first few weeks of the new arrival, we've rounded up the best co-sleeper cots as well, just in case you want to explore this option. Listed below are our top 5 Moses Basket picks, with our recommendations placed in a best-first order. This modern take on the traditional Moses basket is made from bespoke plastic, promising safety and security for your baby. It doesn’t creak, is easy to clean and is completely hypoallergenic. It also has over 300 air holes in its sides and base to make sure that baby has plenty of ventilation, while its handles are integrated into the design, ensuring they won’t accidentally either be left in, or fall into, the basket while baby is sleeping. The sturdy but flexible structure of this plastic moses basket means that there is little movement in the basket itself when picking it up and putting it down, ideal for when your newborn has just nodded off and you need to transfer them to another room undisturbed. The price includes a luxury mattress with a water-repellent core and a 100% cotton waffle liner for breathability. Available in Cornflower Blue, Dove Grey and Snow colours, the Moba is the only Moses basket associated with The Lullaby Trust. Made by a UK company with over 70 years’ experience in producing nursery furniture and bedding, this Moses basket is every inch a luxury item. It cleverly combines traditional materials (wicker and cotton) with a contemporary design to give it a truly luxurious and modern feel. This Noah Pod also comes with everything you need for baby’s first months, including a thick, foam mattress, coverlet and a liner which covers the walls inside the basket. However despite the price and the luxury on offer, the Noah Pod has two main drawbacks: the first – and biggest – is that the mattress isn’t waterproof, so if baby has an accident you’ll have to change the mattress as well as the covers, or invest in a waterproof cover. The other is that the Noah Pod is fairly narrow, despite its overall size, meaning baby may grow out of it fairly quickly. However, if you have got room enough to fit this wicker moses basket in your home and you don't mind purchasing a waterproof mattress cover separately, this traditional looking basket will not only keep your little one cosy, it also makes for a great backdrop for the thousands of pictures everyone will be snapping! A beautiful, traditional choice. The Shnuggle Dreami is the only one of our Moses basket picks that comes with its own wooden stand – saving you from having to buy one separately. Cleverly the stand has been designed so you can use it in two different ways: fixed (where is stands 44cm tall) and rocking (where is stands 10cm tall) and also folds up for travelling or when not in use. Like our number one choice, the Moba Moses basket, the Shuggle Dreami eschews wicker or palm leaf in favour of hypoallergenic plastic for its large ventilated base, making it easy to clean and creak-free. The mattress and lining are also made with breathable 3D mesh materials, with the side facing the baby made from natural cotton. The versatility of this interchangeable cot bed is incredibly handy, but if your little one often needs rocking back to sleep, it can be tricky to transform on the fly. Reminiscent of the Clair de Lune Noah Pod, the Welcome To The World Moses basket combines traditional materials with modern aesthetics. Made from natural wicker with a cotton liner and foam mattress, it also incorporates leather carry handles and a 2.5-tog coverlet. Like most of the Moses baskets here it doesn’t come with a stand, although one is available for an extra £49. The basket itself is narrower than both the Moba and Shnuggle Dreami baskets, although it’s on a par with the Clair de Lune model, however it’s solidly made and looks beautiful in the nursery. The only real drawback is that the supplied basket mattress is little on the thin side, meaning that you may have to buy a better one for anything other than occasional use. Overall, if you like the look of a more traditional moses basket and want a neutral looking design, this is the one you need. It may sound French, but Emilie et Rose is a British nursery brand with headquarters in Devon. Its take on the Moses basket is rather traditional, but no less luxurious for that – thanks to the use of dark oak wicker, soft leather carry straps and 100% cotton liner. The pleated skirt and is a little fussy for our tastes, but it fits snugly around the basket with no need to elastic or other fastenings. However, again the mattress is rather thin, meaning you’ll probably want to replace it with something more luxurious and waterproof. The canopy also has a tendency to fall down unless you take the time to position it correctly – not something you’d expect on a product priced as highly as this. However, for all of its drawbacks, this is an extremely well made, high quality moses basket. Perfectly designed for a more traditional nursery or home. Debating baby formula? Read our guide to the best baby formula 2018 to help you weigh up the pros and cons of bottle formula.